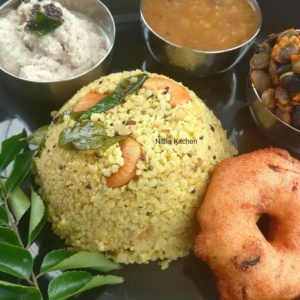 Learn to make Pressure Cooker Millet Venn Pongal ! Wash and Soak millets and yellow moong dal together for 15 - 20 minutes. Meanwhile get ready with the other ingredients. Pressure cook the millet and dal with 3 cups of water for three hisses. In a Pan / kadai , add 1 tbsp ghee. When its hot temper mustard seeds then add whole pepper / cumin seeds (if using), grated ginger, green chili , optional hing and curry leaves. Saute for few minutes say 5 minutes in medium flame finally add roasted cumin powder (if using) and salt. Add everything to the cooked pongal. Now In the same pan add remaining ghee, fry the cashews till golden brown and add it to pongal. Also I have added Avara Kottai / Beans Stir Fry, yielded from my backyard garden in last summer and kept in freezer till use. You can temper first and add all of those with millet and dal in the pressure cooker as explained in Thinal Venn Pongal Recipe. Instead of pressure cooker use instant pot or regular pot, just adjust water accordingly.